If you visit my Pinterest page, you will notice that among the 16 boards I have created, there are three named "I'd Wear This." The three boards differ according to age... "I'd Wear This (if I was 16-years-old)," "I'd Wear This (if I was 29-years-old)" and just plain "I'd Wear This," which is short for "I'd Wear This (Now)," that is, at my current age. Ignore the 16-years-old board because I just started it and it only includes one pin. But if you compare the 29-years-old and Now boards, you will notice that the main difference between the two are the hemlines. The 29-year-old hemlines are thigh-high, whereas the Now hemlines are knee-centric, although there are some thigh-high numbers among the Now hemlines, too. In reality, the hemlines in my closet are almost equally divided between knee-centric and thigh-high. So what's with the short hemlines, Stana? 1. I like shorter hemlines because I have shapely legs and like to show them off. 2. But as I have said in the past, "My skirt's not too short – my legs are too long!" and there is a lot of truth to that because at my height (six feet two), most hemlines will be short on me because they are intended for women who are six inches (or more) shorter than I am. So I am stuck buying skirts and dresses with short hemlines. (Poor, baby!). Wearing Theory sweater and skirt. 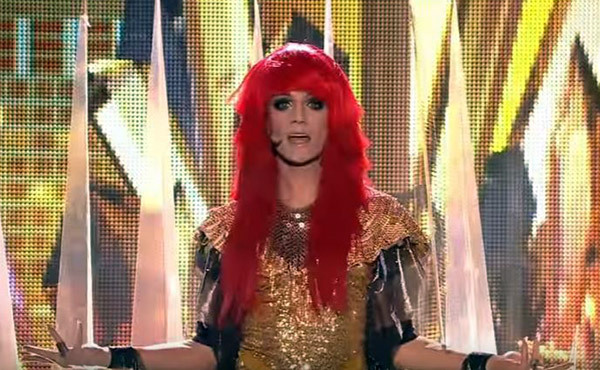 Jerzy Grzechnik femulates Florence Welch on the Polish television version of Your Face Sounds Familiar. The Classics always work when worn well. A woman who owns her style is correct regardless of whats on the runways and racks. As to age, remember the rule: Divide biological age by 2, add 7 and dress for that number. Ms. Stana, We have a couple of thoughts for you, First There are people who can look at a picture of a dress, skirt, pants and make one for your size at a reasonable price. wouldn't think of wearing anything that would cause you to be hot/uncomfortable. If you really want to wear it then come down to south Florida, Put it on and have a blast so to speak. With Love For All The Ladies, Ms. Stacey Anne Smith. At 6'5" I so understand your comments about buying shirts and dresses "long enough" and have been accused on occasion of not dressing "age appropriate." The interesting thing is that ciswomen generally comment favorably on my legs and the showing there of. Still had a number of clothing selections that I've turned down because I do think that it is appropriate to at least attempt to cover the back side.